Join us on FaceBook for the latest news & fun. Sussex Bowl had been a top entertainment destination for the Lisbon, Wisconsin, area since 1972. We have fun and entertainment for all ages, including: pool hall, game arcade, affordable food and beverages, beach volleyball, and of course Bowling. We are well known in the Lisbon area for our homemade pizzas, and on Fridays enjoy our secret recipe hand breaded Fish Fry and homemade potato pancakes. Visit our on-line menu page for a complete list of your favorite pub food. In July of 2008, new owners stepped in and made a great place even better. 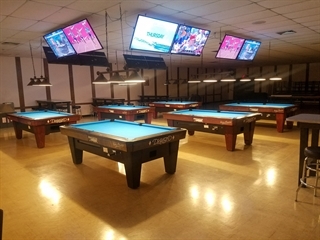 Then in June of 2017, we created our Pool Hall, which features it's own bar and flat screen TV's. With over 40 flat screens in the building, you can be sure to see your favorite sports programming. Watch all UFC Pay Per Views with no cover charge, NFL Sunday Ticket, Big10 Network game, MLB, NBA, and much more. If you have any questions, please call, or use our Contact Us page. Customers are coming to Sussex Bowl from southeast Wisconsin communities, such as: Brookfield, Brown Deer, Colgate, Germantown, Hartford, Hartland, Lannon, Lisbon, Menomonee Falls, Oconomowoc, Pewaukee, Sussex, and Waukesha. Zip codes for Lisbon, WI are: 53089. Copyright © 2004 - 2019 Sussex Bowl All Rights Reserved.